Galway City Central candidates who will benefit from Cllr Billey Cameron's vote (LtoR): John McDonagh, Sharon Nolan, Joe Loughnane, Cllr Colette Connolly, Martina O\Connor, and Imelda Byrne. Central is arguably the most contested, competitive, and unpredictable of the city's three electoral wards, as opposed to Galway City East, where little change is expected; and Galway City West, where the main questions are: Will Fianna Fáil take two seats? and, can the Green's Pauline O'Reilly make the breakthrough? Central however begs myriad questions: Can Labour hold its seat here? Can the Soc Dems' Sharon Nolan or People Before Profit's Joe Loughnane take a seat? Can Colette Connolly win back the seat she lost in 2014? Will Fine Gael struggle to keep its two seats following Padraig Conneely's announcement he is retiring from politics? Could FF capitalise on this and sneak home both its candidates? The answer to most of these lies with Cllr Cameron and his vote. 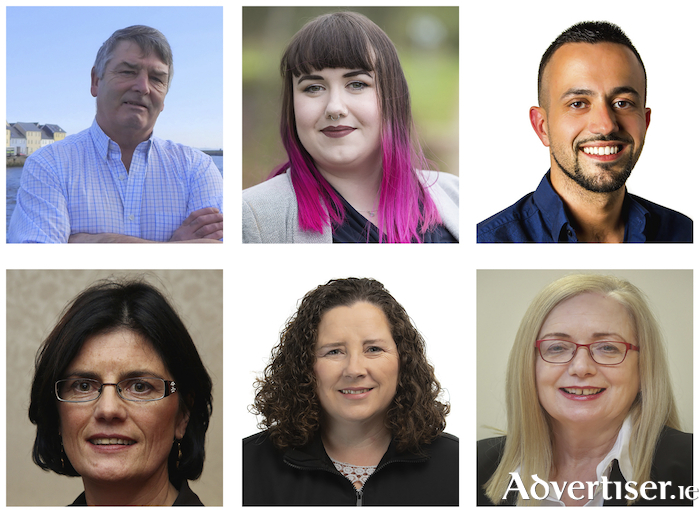 The candidates for the six Galway City Central seats are Cllr Ollie Crowe and Imelda Byrne (Fianna Fáíl ); Cllr Frank Fahy and former Galway footballer Eddie Hoare (Fine Gael ); Cllr Mark Lohan (Sinn Féin ); Sharon Nolan (Social Democrats ); Martina O’Connor (Greens ); Joe Loughnane (People Before Profit ); John McDonagh (Labour ); and Cllr Mike Cubbard, Cllr Colette Connolly, and Mike Geraghty (Independent ). It would be widely accepted that councillors Crowe, Lohan, and Cubbard are all on course to retain their seats. FG should hold at least one, with the incumbent Cllr Fahy the favourite. After that, GCC is extremely difficult to predict with Sharon Nolan, Joe Loughnane, John McDonagh, Colette Connolly, and to a lesser extent Imelda Byrne and Eddie Hoare, all in contention for the final two seats. Six into two will not go, so who are the most likely winners? This is where Cllr Cameron's vote comes in. How it disperses itself among the candidates is key in determining who takes the final two seats. How will Cllr Cameron's vote break down? Labour received more than 17 per cent of first preference votes 2014 in Galway City Central. It will be lucky to achieve even half that come May if poll figures of recent months are anything to go by - even given the caveat that the national poll figures do not fully replicate the unique features on the ground which local elections throw up. Core Labour voters in the ward, who will turn out for the party come hell or high water, will stick with Mr McDonagh [pictured above], while other Labour die-hards will transfer to him the vote they would otherwise have given to Cllr Cameron. However the party knows - indeed must rue the fact - that much of Cllr Cameron's vote will not go to Mr McDonagh. Cllr Cameron is one of the most respected and popular public representatives in Galway city over the last 20 years and his departure from City Hall is to be regretted. While he has always been a loyal Labour man, he also commands a strong personal vote that goes above party politics. How will this vote break down? One of the most likely beneficiaries will be the Soc Dem's Sharon Nolan [pictured above]. It was obvious in the 2016 General Election that disillusioned former Labour voters, largely switched to voting for the Soc Dems, and show no signs of changing that opinion. Also the Soc Dems have been attracting a calibre of young and dynamic talent which once would have been Labour's (a fact some Galway Labour sources privately acknowledge ). Given Ms Nolan is the Soc Dems' best chance of winning a seat, that portion of Cllr Camern's vote will be crucial to her. Councillors Lohan and Cubbard are also likely to benefit from what was once the Cllr Cameron vote. A number of years ago, Sinn Féin tried to get Cllr Cameron to join the party, an offer he refused. However given Cllr Lohan's strong roots in the trade union movement and his Left-Republican outlook, his appeal for Cllr Cameron voters is clear. Cllr Cubbard's strong community activism, work on ground, his values, and moderately left views will also see him benefit to a certain extent from what was once Cllr Cameron's vote. The big question though is the former Labour, and now Independent, city councillor, Colette Connolly. Cllr Connolly has wisely switched from Galway City West to run in Galway City Central, as her core base, the Claddagh, was transferred into the latter constituency. So can she win back the seat she lost in 2014? Insider believes the Claddagh will give Cllr Connolly a strong base from which to challenge for a seat, and she is certainly in with a serious shout. However Insider also contends that predictions from some quarters that Cllr Cameron's former seat is Cllr Connolly's to lose, and that she will stroll to victory, are wide of the mark. In 2014, Labour ran both her and John McDonagh. Both were based in the Shantalla area resulting in the Labour vote splitting (4.26 per cent to Connolly and 4.15 to McDonagh ), and neither candidate coming close to winning a seat. At the time, many saw this as a deliberate move by the party to split Cllr Connolly's vote and oust her - her sister Catherine having already left Labour in dramatic circumstances. Claddagh is a great base from which Cllr Connolly can build a campaign, and she will pick up a certain numberof ex-Labour voters, but the presence of Mr McDonagh will deny her the level of votes she could have otherwise expected in Shantalla, where she also has strong roots. Could Labour, aware it will struggle to challenge for a seat this time out, be adopting a similar strategy to 2014 to ensure, that, if Mr McDonagh cannot win, neither should Cllr Connolly? It is also hard to see high numbers of Cllr Cameron's votes transferring to her as there is no love lost between Labour and the Connollys. Claddagh is also more of a Catherine area than a Colette area, and vigorous support from the TD will be vital to Cllr Connolly's re-election hopes. That said, votes in a general election are not always replicated in local flections. Furthermore, no candidate can rely solely on one area within a large and populous ward - especially when there is competition for the Independent vote from Cllr Cubbard, who is regarded as far stronger, and whose campaign is already well under way. Again, Insider stresses that he expects Cllr Connolly to be in the mix for one of the last two seats, battling with Ms Nolan, Mr Loughnane, and perhaps Ms O'Connor [pictured above], as the Greens polled above-average for Galway City Central in 2014. Again, this outcome will to a certain extent, be determined by who can win most of Cllr Cameron's former vote. Cllr Cameron's vote will be less influential when it comes to the seat vacated by Cllr Padraig Conneely. Fianna Fáil's Imelda Byrne will be hoping to take advantage of this, especially as Cllr Conneely came close to losing his seat in 2014. As such, the second FG seat might be shaky. However national polls putting FG ahead of FF, coupled with local factors, means FG may pull it off again.